Pensions get all the attention when it comes to Illinois’ collapsing finances. But there’s another government-worker benefit also wreaking fiscal havoc – free and heavily-subsidized retiree health insurance for state workers. Illinois has promised $166 billion in retiree health insurance benefits to public-sector workers over the next 38 years. Actuaries say the state should have $73 billion invested today so it can safely make those payments in the future. The problem is, the state hasn’t set aside anything at all. That $73 billion hole is yet another financial time-bomb – one that’s been totally ignored thus far by Illinois’ lawmakers, civic leaders and the media. Unfunded healthcare promises have grown 70% in the past decade and are now compounding Illinois’ state and local pension crises. Illinois courts have ruled that public employee health obligations, like pension benefits, cannot be impaired. Unlike pensions, however, nothing is set aside and invested to cover that future expense. The liability is entirely unfunded, which is called a “pay-go” system. Instead of setting aside money for future costs, the state simply pays retiree healthcare costs as they are incurred. Growing future costs are left to future budgets. 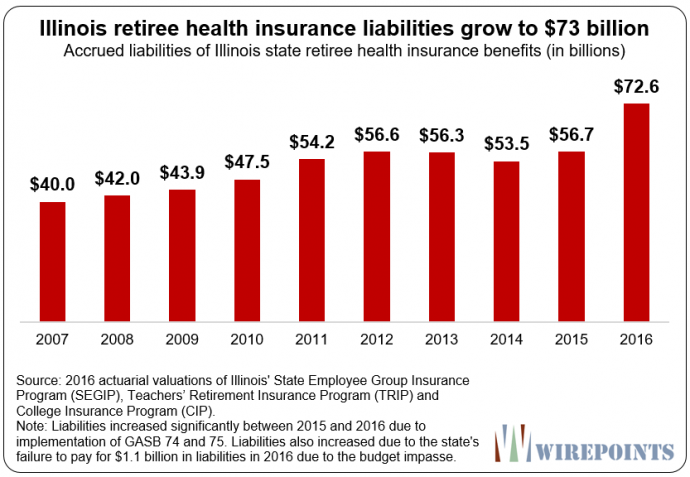 Expect those annual payments for retiree health benefits to further squeeze Illinois’ budgets as the bills come due. Payments by the state – meaning taxpayers – will rise from $1 billion today to nearly $6 billion in the future to meet the state’s yearly retiree health insurance obligations. Officially, retiree health and pension costs are already set to consume more than a quarter of the state budget over the next 30 years. But the state’s official numbers grossly underestimate Illinois’ true retirement costs. If the real cost of pensions and retiree health insurance were properly measured and paid for, they would consume an untenable 50 percent of the state’s annual budget.